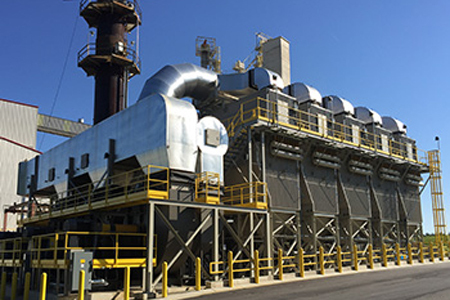 Tri-Mer catalytic high temperature filters remove particulate (PM), NOx, SO2, HCl, and other acid gases treated at over 90% removal. The filters operate up to 1650°F. Tri-Mer high temperature filters are chemically inert and corrosion-resistant, as would be expected from ceramic materials. High temperature filters are manufactured in two varieties: standard Non-Catalyst Ceramic Filters and Ceramic Catalyst Filters. The catalyst filter is identical to the standard filter, except that it has nanobits of SCR catalyst embedded in the filter walls for NOx removal, Organic HAPs, CO, and dioxin destruction. NOx destruction takes place at lower temperatures than standard SCR big-block reactors that require 650°F. Ceramic Catalyst filters show good destruction as low as 350°F and over 90% at 400°F for most applications. Equally effective at higher temperatures up to 750°F. Particulate (PM) is removed to ultralow levels (<2 mg/Nm3, 0.001 grains/dscf) at temperatures up to 1650°F. Ceramic filters are highly effective on submicron PM: equal to fabric bags and better than ESP. The UltraCat Catalytic Filter System is an excellent replacement for spray dryer ESP.